This morning the Saudi-led coalition was accused of bombing a school bus in Yemen. Dozens of people have been killed, mainly children. Abdul-Ghani Nayeb, a health department chief in Saada, has said that at over 40 people were killed and 60 injured. 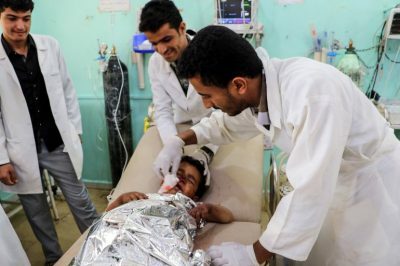 This is the latest in a long line of Saudi-inflicted atrocities. The war has killed thousands of civilians and created one of the worst humanitarian crises in the world. “This atrocity cannot be ignored. Those responsible must be held fully accountable. Thousands of people have been killed in this terrible war, and many more will be as long as the bombardment continues.